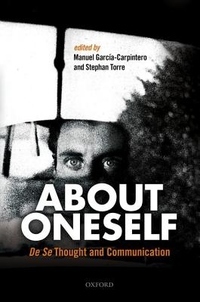 This volume addresses foundational issues concerning the nature of first-personal, or de se, thought and how such thoughts are communicated. One of the questions addressed is whether there is anything distinctive about first-person thought or whether it can be subsumed under broader phenomena. Many have held that first-person thought motivates a revision of traditional accounts of content or motivates positing special ways of accessing such contents. Gottlob Frege famously held that first-person thoughts involve a subject being 'presented to himself in a particular and primitive way, in which he is presented to no-one else.' However, as Frege also noted, this raises many puzzling questions when we consider how we are able to communicate such thoughts. Is there indeed something special about first-person thought such that it requires a primitive mode of presentation that cannot be grasped by others? If there really is something special about first-person thought, what happens when I communicate this thought to you? Do you come to believe the very thing that I believe? Or is my first-person belief only entertained by me? If it is only entertained by me, how does it relate to what you come to believe? It is these questions that the volume addresses and seeks to answer.